Kathryn Currier. Kathryn Currier from Byers, Colorado, joined the staff in January. She was ordained as a minister (exhorter). She also became a researcher, writer, and publisher for Water of Life. Meeting Lisa. The Lord brought me face to face with Lisa. I had not seen her since May of 2005. The conversation was the same as the last time I had talked to her, she was still in rebellion. Meeting her was a work of righteousness. While praying on June 16th, I overcame a spirit with Lisa. The next day all her testimonies were discovered in archives. I brought them out on the 17th and posted them on my website. The 17th of June was also the day God called me into the ministry of the Garden Tomb in Jerusalem. Most interesting that God brought Lisa’s testimonies out on the same date. Just another confirmation she is my wife given to me by God August 28, 1987. This was another work of righteousness. I posted the article on my website on July 2nd. I believed as Kathie wrote, that Jesus is talking about taking the Kingdom of God from Israel and bringing it to the United States. I am even more convinced today. In 1906 God poured out His Spirit at Azusa Street in Los Angeles and it spread worldwide. You may want to consider the last three letters of Azusa, they are “USA”. Unbeknownst to me we had several people whose ancestors were on the Mayflower attending Water of Life Ministries. David Kaspareit, a trustee, Sadie Peters, both verified by the General Society of Mayflower Descendants, Kathie Davidson, and Kathryn Currier, who are working on verification. David has addressed the local Mayflower society at their annual dinner. Baby Dove Appears. August 2004 God sent three doves to my patio; a father, mother and baby, at Chase Oaks and talked to me about John being born. On the morning of July 20th of this year I began the broadcast by praying a very powerful prayer asking God to manifest himself to us this day. 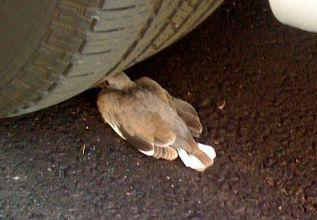 Just after I finished praying a man came in and told me this young dove was in front of my tire. It was there about an hour and then flew across the street to the sidewalk. It is the most powerful exhortation that John will be born. The baby dove July 20th. I overcame a spirit with Lisa on September 24th, praying through severe chest pains and throat pains for approximately 30 minutes. I was very encouraged. Binding Witchcraft. On Friday, September 26th I prayed binding witchcraft from 7:40 am until 3:20 PM with only had a few short interruptions. I grew so weak, I had such little strength, that I was unable to stand and instead lay across the blue chairs in the Fellowship Hall. I overcame the weakness when a recording of Terry and Kathy Mai singing “I Proclaim the Name of the Lord” began playing. Within fifteen minutes I was back to normal. I realized then I could join my faith with the anointing of Terry Mai’s singing that was on the worship tapes. Four days later I again spent several hours binding witchcraft though not as intense as the previous Friday. God opened up the Spirit to me about prophets. I could see how prophets have always existed, at least from Abraham. God said Abraham was a prophet (Genesis 20:7). Socialism Spirit in Our Government. After strong praying on October 13th I broke through the socialism spirit in our government. Terre Brown was delivered at about the same time. She had been sick several days; I was unaware of her healing until later that day. Terre Brown’s Testimony: In October 2008, I became very sick on Saturday afternoon, the 11th. For three days I was mostly passed out asleep with fever, horrible aching pain and nausea. What little time I could stay awake I would try to read Psalms, but I was very ill, dizzy, barely able to eat or walk around. In a conversation with Doyle, he said that he was overcoming socialism and was praying me through that as well. On Monday afternoon at 4:15, I suddenly knew that the spirit of this sickness was broken. I tried calling Doyle but he did not answer his phone. Within fifteen minutes all my symptoms were gone, and I was healed. At church that night, Doyle spoke that he had broken through and overcome at 4:00 that afternoon! God’s Hand Against Obama. November 2nd, two days before the national election, the Lord spoke to me early Sunday morning telling me to speak to Candidate Obama; that His hand was against him, because he had lied to God's people making them promises that he could not perform. Two days later, on November 4th, Obama was elected. The 23rd of November was the last day that Terry Mai led worship. Candace played a instrumental piece on the piano and there was a powerful move of the Spirit. On the 16th of December, the date of my father’s birthday, God joined Kathie & me together as husband and wife. Improvements to the Building. We updated the fellowship hall, painted and added a new backdrop in March. New carpet was added to the Fellowship Hall, hallways, north offices, nursery room, and computer room in April. In May we added new black top and striping to the parking lot. We installed a Sony Remote Camera in the sanctuary for our TV and the Internet broadcasting in March. Willow Creek’s Parking Lot. As I was walking on the new parking lot thanking God, the Lord said to me “You should love your neighbor as yourself.” I said, “Are you talking to me about building them (our neighbors, WillowCreek Fellowship) a parking lot?” I moved on it immediately. I did not have the money when God spoke that to me, it took about six or seven weeks to gather it. I gave WillowCreek the money as I received it, until they had enough to pay for it in full. They contacted the asphalt paving company, the same company that did our parking lot. They were driving on it in September. In June we installed a Security System throughout the outside of the church. Casey Alvis and Nelson Hoke began working on staff as Security Guards in July. Casey Alvis is now Chief of Security at Water of Life Ministries. Wendy Hornal began helping more at Water of Life on staff in July. We went off of television on KODE in Joplin, Missouri and KSNF, Joplin and Pittsburg Kansas in January.